This article is about the rock group. For their self-titled album, see Temple of the Dog (album). For the Wikipedia Tip of the Day (TOTD), see Wikipedia:Tip of the day. Temple of the Dog was an American rock supergroup that formed in Seattle, Washington in 1990. It was conceived by vocalist Chris Cornell of Soundgarden as a tribute to his friend, the late Andrew Wood, lead singer of the bands Malfunkshun and Mother Love Bone. The lineup included Stone Gossard on rhythm guitar, Jeff Ament on bass guitar (both ex-members of Mother Love Bone), Mike McCready (Pearl Jam) on lead guitar, and Matt Cameron (Soundgarden and later Pearl Jam) on drums. Eddie Vedder appeared as a guest to provide some lead and backing vocals. The band released its only album, the self-titled Temple of the Dog, in April 1991 through A&M Records. The recording sessions took place in November and December 1990 at London Bridge Studios, in Seattle, Washington with producer Rakesh "Rick" Parashar. Although earning praise from music critics at the time of its release, the album was not widely recognized until 1992, when Vedder, Ament, Gossard, and McCready had their breakthrough with Pearl Jam. Cameron would later join Pearl Jam, serving as drummer since 1998. The band toured in 2016 in celebration of the 25th anniversary of their self-titled album. Temple of the Dog was started by Soundgarden frontman Chris Cornell, who had been a roommate of Andrew Wood, the lead singer of Malfunkshun and Mother Love Bone. Wood died on March 19, 1990, of a heroin overdose, the day Cornell got back from a tour. As he went on to tour Europe a few days later, he started writing songs in tribute to his late friend. The result was two songs, "Reach Down" and "Say Hello 2 Heaven", which he recorded as soon as he returned home from touring. The recorded material was slow and melodic, musically different from the aggressive rock music of Soundgarden. Cornell approached Wood's former bandmates, Stone Gossard and Jeff Ament—who were still figuring out how to continue without Mother Love Bone—with the intention of releasing the songs as a single. Ament described the collaboration as "a really good thing at the time" for Gossard and him that put them into a "band situation where we could play and make music." The band's lineup was completed by the addition of Soundgarden (and later Pearl Jam) drummer Matt Cameron and future Pearl Jam lead guitarist Mike McCready. They named themselves Temple of the Dog, a reference to a line in the lyrics of the Mother Love Bone song "Man of Golden Words". The band started rehearsing "Reach Down", "Say Hello 2 Heaven", and other songs that Cornell had written on tour prior to Wood's death, as well as re-working some existing material from demos written by Gossard, Ament, and Cameron. One such demo became a song for two bands, recorded as "Footsteps" by Pearl Jam and "Times of Trouble" by Temple of the Dog. The idea of doing covers of Wood's solo material also came up but was abandoned quickly, as they realized it would make people (including Wood's close friends and relatives) think the band was "exploiting his material." Temple of the Dog was released on April 16, 1991, through A&M Records and initially sold 70,000 copies in the United States. Ament recalled that A&M requested a Pearl Jam sticker be on the cover—as they had just picked their new name—because "it'll be a good thing for us", but they refused. The album received favorable reviews but failed to chart. Critic Steve Huey of AllMusic later rated the album with four-and-a-half stars out of five, stating that the "record sounds like a bridge between Mother Love Bone's theatrical '70s-rock updates and Pearl Jam's hard-rocking seriousness." David Fricke of Rolling Stone also wrote in retrospect that the album "deserves immortality." The band members were pleased with the material, as it achieved its purpose; Cornell believed that "Andy really would have liked" the songs, and Gossard also asserted that he thought Wood would be "blown away by the whole thing". Soon after the album's release, Soundgarden and Pearl Jam embarked on recording their next albums, and the Temple of the Dog project was brought to a close. In the summer of 1992, the album received new attention. Although it had been released more than a year earlier, A&M Records realized that they had in their catalog what was essentially a collaboration between Soundgarden and Pearl Jam, who had both risen to mainstream attention in the months since the album's release with their respective albums, Badmotorfinger and Ten. A&M decided to reissue the album and promote "Hunger Strike" as a single with an accompanying music video that had been previously filmed. The attention allowed both the album and single to chart on Billboard and resulted in a boost in album sales. The album was among the 100 top-selling albums of 1992. 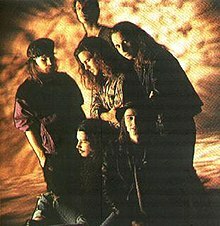 Temple of the Dog ended up selling more than a million copies, achieving platinum certification by the Recording Industry Association of America. Ament, Cameron, Cornell, and McCready later reunited under the name M.A.C.C. to record a cover of Jimi Hendrix's "Hey Baby (Land of the New Rising Sun)" for the 1993 tribute album Stone Free: A Tribute to Jimi Hendrix. The song has since been included as part of the band's live set. In a 2007 interview with Ultimate Guitar Archive, Cornell stated he would be open for a Temple of the Dog reunion, or "some collaboration with any combination of those guys". He also revealed that Temple of the Dog was the reason he joined Audioslave, as the experience made him "keep an open mind" about collaborations with musicians from other bands. During their initial existence the only time Temple of the Dog played a full one-hour set was while rehearsing and writing the material for the album. The band (with the exception of Vedder) performed in Seattle at the Off Ramp Café on November 13, 1990. They also opened for Alice in Chains, following the short lived Seattle group Panic, on December 22, 1990, at the Moore Theatre in Seattle. In the time since the album's release, the band has re-formed for short live one-off performances on occasions where both Soundgarden and Pearl Jam were performing. Temple of the Dog performed "Hunger Strike" on October 3, 1991 at the Foundations Forum in Los Angeles, California; a three-song set on October 6, 1991 at the Hollywood Palladium in Hollywood for the RIP Magazine 5th anniversary party (Temple of the Dog played after secret headlining act Spinal Tap); and "Hunger Strike" on both August 14, 1992, at Lake Fairfax Park in Reston, Virginia and September 13, 1992 at Irvine Meadows Amphitheater in Irvine, California (both shows were part of the Lollapalooza festival series in 1992). The band also played "Reach Down" on the latter occasion. At a Pearl Jam show at the Santa Barbara Bowl in Santa Barbara, California, on October 28, 2003, Cornell joined the band on-stage, effectively reuniting Temple of the Dog (Cameron had been the drummer for Pearl Jam since 1998) for renditions of "Hunger Strike" and "Reach Down". Cornell also performed Audioslave's "Like a Stone" and Chris Cornell's "Can't Change Me". The version of "Reach Down" recorded that night later appeared on Pearl Jam's 2003 fan club Christmas single. Pearl Jam has also been known to perform "Hunger Strike" live without Cornell on rare occasions. Cornell's post-Soundgarden band, Audioslave, added "All Night Thing," "Call Me a Dog," and "Hunger Strike" to its live set in 2005. Additionally, Cornell has added the aforementioned songs, plus "Pushin Forward Back," "Wooden Jesus," "Reach Down," and "Say Hello 2 Heaven," to his solo live set. On October 6, 2009, Cornell joined Pearl Jam onstage to perform "Hunger Strike" in Los Angeles, effectively reuniting Temple of the Dog once again. Following the brief 2009 reunion show, a fan group emerged on Facebook in April 2010 supporting a 20th anniversary benefit reunion tour to take place beginning April 16, 2011. During Labor Day weekend, 2011, Cornell joined Pearl Jam onstage at Alpine Valley in Wisconsin for PJ20 (Pearl Jam's twentieth anniversary celebration). On September 3, he joined them for a four-song set, which included the songs "Stardog Champion" (a Mother Love Bone cover with Cornell on vocals), "Say Hello 2 Heaven", "Reach Down", and "Hunger Strike". The September 4 appearance included a four-song set with Cornell joining in on "Hunger Strike", "Call Me a Dog", "All Night Thing", and "Reach Down" (which also included Glen Hansard, Dhani Harrison of Thenewno2, Davíd Garza, and Liam Finn). On both October 25 and 26, 2014, Cornell joined Pearl Jam onstage to perform "Hunger Strike" at Shoreline Amphitheater in Mountain View, California during the 28th Annual Bridge School Benefit. The October 26 concert marked the last time that Vedder and Cornell performed the song together. On January 30, 2015, Pearl Jam bandmates (minus Vedder) Stone Gossard, Jeff Ament, and Matt Cameron joined Chris Cornell and Mike McCready during the Mad Season Sonic Evolution Concert at Benaroya Hall with the Seattle Symphony. The group performed two songs, "Reach Down", and "Call Me A Dog". The band finally officially toured in the fall of 2016 in celebration of the 25th anniversary of their self-titled album. Vedder did not participate on the tour, citing "family commitments", but the crowd sang his part in "Hunger Strike", and Cornell dedicated the song to Vedder during the band's concert at the Paramount Theatre in Seattle on November 21, 2016. ^ a b c d e f g Nicholls, Justin (April 14, 1991). "KISW 99.9 FM: Seattle, Radio Interview by Damon Stewart in The New Music Hour with Chris Cornell, Jeff Ament and Stone Gossard". Fivehorizons.com. Retrieved October 3, 2007. ^ O'Brien, Clare (June 27, 2007). "A conversation with Chris Cornell part 2". Chris Cornell Fan Page. Archived from the original on October 11, 2007. Retrieved October 3, 2007. ^ Cohen, Jonathan. "The Pearl Jam Q & A: Lost Dogs". Billboard. 2003. ^ a b c "Chris Cornell Open To Revisiting Temple". Ultimate Guitar Archive. September 14, 2007. Retrieved October 3, 2007. ^ a b Jeff Giles (April 16, 2016). "How Temple of the Dog Helped Members of Soundgarden and Pearl Jam Mourn a Friend". Ultimate Classic Rock. Retrieved May 30, 2017. ^ Chad Childers (April 16, 2017). "26 Years Ago: Temple of the Dog Release Their Self-Titled Album". Loudwire. Retrieved May 30, 2017. ^ David Fricke (May 29, 2017). "Chris Cornell: Inside Soundgarden, Audioslave Singer's Final Days". Rolling Stone. Retrieved May 30, 2017. ^ Erlewine, Stephen Thomas. "( Temple of the Dog > Biography )". AllMusic. Retrieved October 3, 2007. ^ Huey, Steve. "( Temple of the Dog > Review )". AllMusic. Retrieved October 3, 2007. ^ Fricke, David (December 14, 2000). "Temple of the Dog: Temple of the Dog". Rolling Stone. Retrieved October 3, 2007. ^ a b "Gold & Platinum Searchable Database – Search Results – Temple of the Dog". Recording Industry Association of America. Retrieved November 25, 2017. ^ a b "Pearl Jam: 1990/1991 Concert Chronology". Fivehorizons.com. Retrieved October 3, 2007. ^ "Kerrang! 100 greatest gigs of all time". ^ a b "Pearl Jam: 1992 Concert Chronology part 2". Fivehorizons.com. Retrieved October 3, 2007. ^ "Pearl Jam: 2003 Concert Chronology part 3". Fivehorizons.com. Retrieved October 3, 2007. ^ "Pearl Jam: 1996 Concert Chronology part 2". Fivehorizons.com. Retrieved October 3, 2007. ^ "Pearl Jam: 1998 Concert Chronology". Fivehorizons.com. Retrieved October 3, 2007. ^ bcd_71 (November 1, 2005). "Review of Audioslave @ Boston, MA". The Audioslave Fan Forum. Archived from the original on September 27, 2007. Retrieved August 25, 2007. ^ Brownlee, Clint (October 5, 2007). "Seattlest Misses Greyhound, Catches Chris Cornell's Hit Parade". Seattlest. Retrieved November 8, 2007. ^ Zahlaway, Jon (April 20, 2007). "Live Review: Chris Cornell in Boston". LiveDaily. Archived from the original on October 13, 2007. Retrieved October 3, 2007. ^ Snelling, Nick (October 31, 2007). "Chris Cornell live at The Forum". BEAT magazine. Archived from the original on December 30, 2008. Retrieved November 8, 2007. ^ "Facebook". Facebook. Retrieved August 19, 2014. ^ "TEMPLE OF THE DOG Reunion At PEARL JAM's 20th-Anniversary Concert (Video) - Sep. 4, 2011". Blabbermouth.net. Archived from the original on February 1, 2013. Retrieved September 6, 2011. ^ Letkemann, Jessica. "Pearl Jam Caps PJ20 Fest With The Strokes, QOTSA, Chris Cornell All-Star Jam". Billboard.com. Retrieved September 6, 2011. ^ Kot, Greg (September 4, 2011). "Concert review: Pearl Jam at Alpine Valley Music Theatre". Chicago Tribune/ChicagoTribune.com. ^ "Temple of the Dog Reunite for 'Hunger Strike' at Bridge School Benefit". Rolling Stone. October 26, 2014. Retrieved October 26, 2014. ^ Andy Greene (May 23, 2017). "Flashback: Chris Cornell, Eddie Vedder's Final 'Hunger Strike' Duet". Rolling Stone. Retrieved June 6, 2017. ^ Casebeer, Glen. "McCready Makes Mad Season Show a Night Seattle Will Truly Never Forget". NorthWestMusicScene.com. Archived from the original on February 3, 2015. Retrieved January 31, 2015. ^ Roffman, Michael (July 20, 2016). "Temple of the Dog announce first-ever tour dates for 25th anniversary". consequenceofsound. Retrieved July 20, 2016. ^ Maine, Samantha (November 6, 2016). "Watch Pearl Jam and Soundgarden supergroup Temple of Dog cover David Bowie". NME. Retrieved November 6, 2016. ^ "Seattle celebrates Temple of the Dog — 25 years later". The Seattle Times. November 21, 2016. Retrieved August 4, 2017. ^ "Temple of the Dog - Hunger Strike - Seattle (November 21, 2016)". November 22, 2016. Retrieved August 4, 2017. ^ "Temple of the Dog Chart History: Albums". Billboard. Retrieved February 19, 2008. ^ "Top Albums/CDs - Volume 56, No. 11, September 12, 1992". RPM. Archived from the original on January 22, 2009. Retrieved March 7, 2008. ^ "Gold Platinum Database: Temple of the Dog". Canadian Recording Industry Association. Archived from the original on December 2, 2013. Retrieved January 29, 2012. ^ a b "Temple of the Dog Chart History: Singles". Billboard. Retrieved February 19, 2008. ^ "Canadian Charts — Hunger Strike". RPM. Archived from the original on January 22, 2009. Retrieved March 7, 2008. ^ "Discography Temple of the Dog". Hung Medien. ^ "UK Singles & Albums Chart Archive — Temple of the Dog". Archived from the original on December 1, 2008. Retrieved December 8, 2007.